This site already has numerous reviews of different sets of World War II German Infantry, so clearly the appetite for such figures is vast, and of course in this case these figures complement the range of vehicles and planes that represent the bulk of the output from this company. With such a wealth of figures for this subject, the discerning buyer has the luxury of considering the relative merits of each and planning the purchases accordingly, so what more does this set offer? Unlike most of the other sets we have reviewed, this one is made in a hard plastic, and the opportunity has been taken to make some of the figures as kits, which allows more scope for customisation. To get an idea of the actual parts on offer, click here to see the full sprue (2 of each are included in a box). This approach can open up more possibilities, but assembled figures in this scale often have a less natural look to them than ones sculpted as one piece, and that seems to be the case here. We put together the running man as per the instructions, yet the pose is not convincing, and the same goes for the crawling man with rifle and grenade. The private resting on the small mound has a separate left arm but also a very noticeable and ugly ridge down the join. The remaining poses however are OK, with the two-man crew for the heavy machine gun being our favourites. As with almost any conflict the participants start out a good deal smarter than they finish, so it is little wonder that Hasegawa chose to depict the early war Germans in this set. Apart from the general neatness about them, these men wear the M1935 tunic and the long marching boots that they wore during the early victorious campaigns. Curiously all have just two ammunition pouches either side of the belt buckle instead of three, and although obscured those men with the MP40 machine guns seem to lack the longer ammo pouches to match the weapon. The level of kit varies, but is fairly par for the course in such sets. 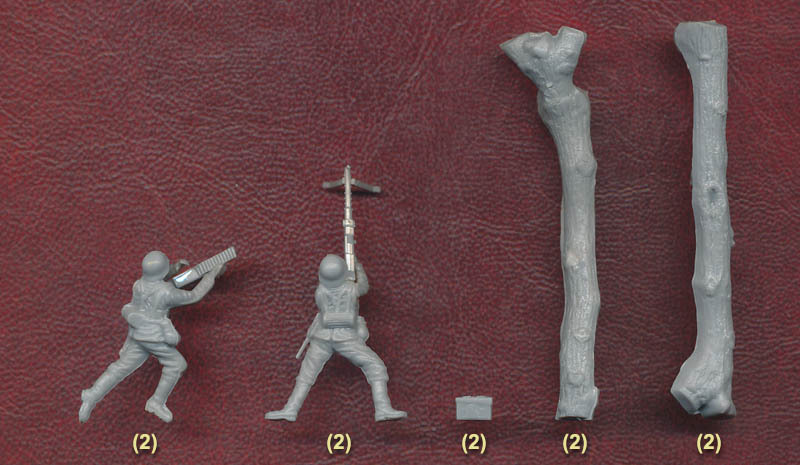 The weapons are reasonably done, but there is one very surprising inclusion - a bazooka. The bazooka ('M1 anti tank rocket launcher') was a US weapon, which naturally only saw service when the US entered the war in 1941. In time the Germans captured examples of this good weapon and, as with many others, produced their own (improved) version, the Panzerschreck. Although the packaging states this set includes a bazooka, in fact it is a Panzerschreck, and a fair representation too apart from the absence of the very important shield. However, this weapon was introduced in 1943, by which time this early war uniform was becoming less common, so we feel this was not a great choice for inclusion. Another feature of this item is that both crew are wearing gas-masks, which were initially used as protection from the smoke and flames it emitted in the absence of a shield. The detail and sculpting are reasonably good, and in general there is very little flash. However many of the figures have large chunky round lumps on them which mars them, though thankfully these are at least all round the back. The set also includes a small assortment of ammunition boxes plus some fallen trees - not likely to make the set much more appealing but all such things are still welcome. The limited and sometimes poor poses plus the excess plastic made this a lacklustre set in our view, yet those looking for ever more possibilities with this subject may well find material here that they will find useful.